Rev. 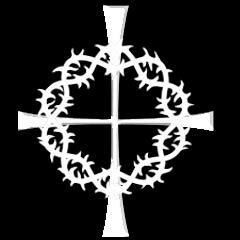 Francis T. Williams, CSV, died of cancer on Dec. 30, 1970 at the local hospital in Boca Raton, FL. He was 63. Fr. Williams was born Oct. 15, 1907 in Chicago and attended schools there, including two years at Quigley Preparatory Seminary. He also attended seminary at Catholic University of America in Washington, DC and Kendrick Seminary in Webster Grove, MO. His ministry as a Viatorian began when he entered the Clerics of St. Viator in 1933. Fr. 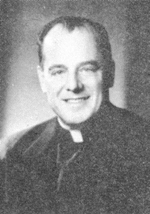 Williams professed his first vows on Sept. 8, 1934 and his perpetual vows on Sept. 8, 1937. He was ordained to the priesthood on Mar. 4, 1939. Fr. Williams earned a Bachelor of Arts degree in English from St. Viator College in Bourbonnais and master degrees from Loyola University in Chicago and the University of Chicago. He earned a doctorate in education administration from Fordham University in New York City. Prior to his studying for the ministry, he had a successful career as a production director for both the National and Columbia broadcasting companies. His priestly assignments included serving as principal of St. Joseph School for the Deaf in New York City; teaching radio production and announcing at St. Ambrose College in Davenport, IA; and teaching at Catholic University of America and the Fournier Institute in Lemont. In 1961, while serving as an administrator at Immaculate Conception Church in Kankakee, Fr. 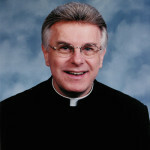 Williams was assigned as principal at St. Patrick Central High School, now Bishop McNamara High School, where he served until 1966. Fr. Williams later served as assistant professor at Barry College in Miami, FL and as associate professor of graduate education at Loyola University in New Orleans. At the time of his passing, he was on leave from his position as associate professor of education at St. Leo College in St. Leo, FL. Funeral services were held Jan.2, 1971 at St. Joan of Arc Church in Boca Raton, FL and on Jan. 4 at St. Viator Church in Chicago, where the Rev. Thomas J. Grady, Auxiliary Bishop of Chicago, offered the homily. Fr. Williams was buried in the Viatorian Community plot at Queen of Heaven Cemetery in Hillside, IL. Taken from an obituary from the Kankakee Daily Journal, not dated.